GirlsAndBeyond: Let's go Gangnam Style! How do you guys like it? Let me know! This is cute but I think it would have been more interesting if you changed the facial expression on each finger nails. Feel free to enter my first ever giveaway, it's ending soon! 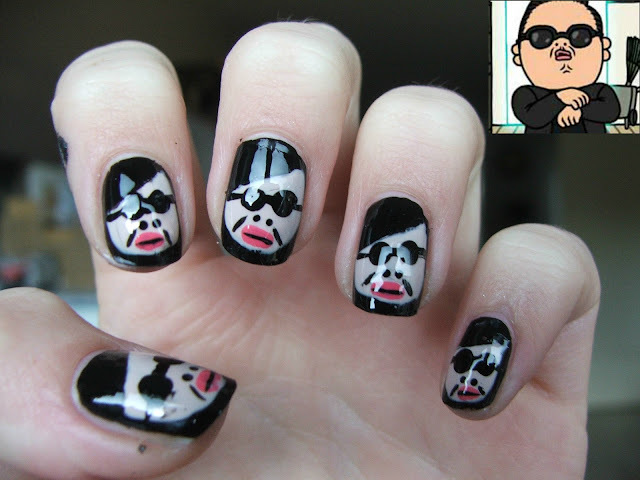 Wat een grappige nail-art, echt heel origineel! Thanks for the nice comments on my blog ..
hahahhah these are so cuuute!!! hahhahah these are so cute!!! I bet you got a lot of compliments on them. I think you need to submit these to Hello Giggles for their nails of the day post. That's a great idea, thanks! !